We are the proud owners of two apple trees and one pear tree at our new home. One of the apple trees bore fruit this year. The house has been unoccupied for at least one year, so I am confident that these apples were not sprayed or tended to in any manner other than that dictated by weather and God. 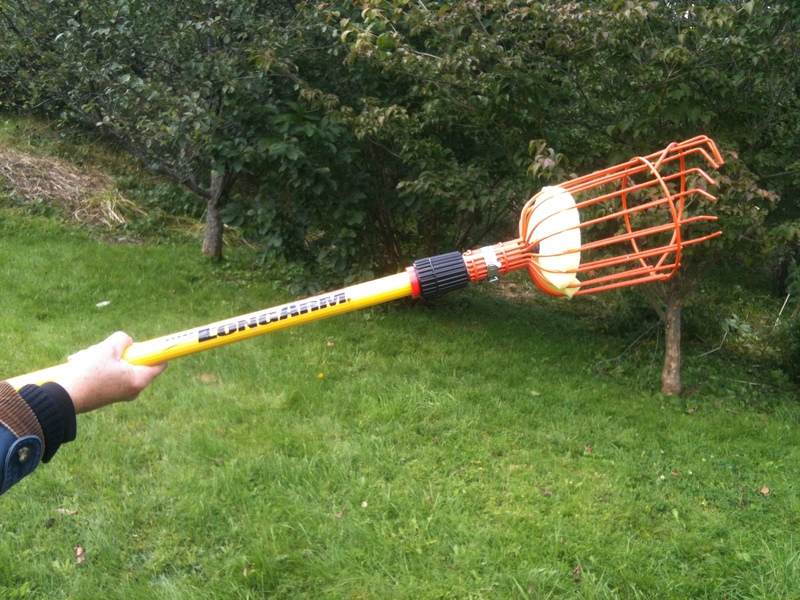 Husband saw those bright red fruits on the too-tall tree (it hasn’t been properly pruned), and ordered an apple picker. 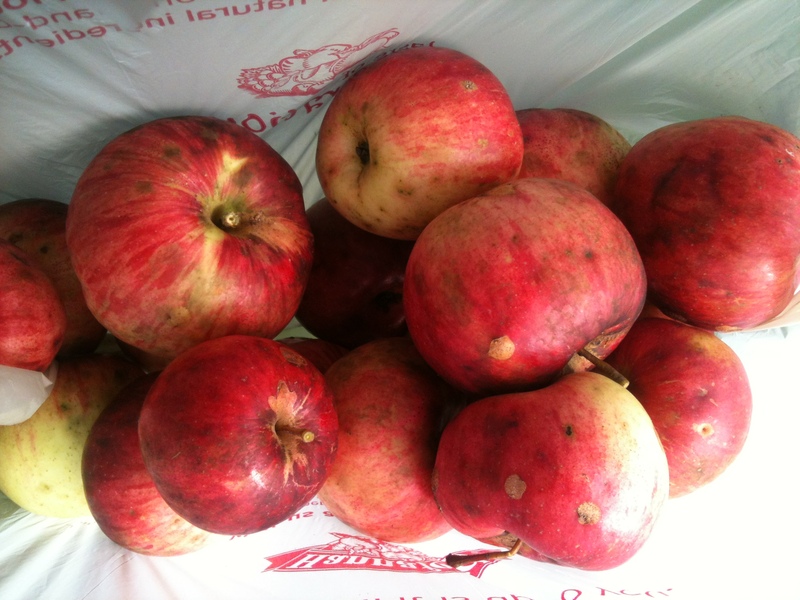 There are 12 decidedly organic apples in that bag. Two were unusable – too much insect damage – but the rest went into a pie/crisp. More on that in a bit. •	Pesticides. Conventional growers use pesticides to protect their crops from molds, insects and diseases. When farmers spray pesticides, this can leave residue on produce. Some people buy organic food to limit their exposure to these residues. According to the USDA, organic produce carries significantly fewer pesticide residues than does conventional produce. However, residues on most products — both organic and nonorganic — don’t exceed government safety thresholds. •	Food additives. Organic regulations ban or severely restrict the use of food additives, processing aids (substances used during processing, but not added directly to food) and fortifying agents commonly used in nonorganic foods, including preservatives, artificial sweeteners, colorings and flavorings, and monosodium glutamate. “Organic apple-growing methods leave soil in better shape and has fewer potential negative impacts on the environment than conventional growing methods do. To me, the conclusions of the debate are clear: How you raise food may or may not affect its nutritional value, but it will certainly affect its safety. The use of pesticides is of enormous concern, and keeping this concern in the public eye will insure that good science is practiced and the collective wisdom of farmers, scientists, and consumers will produce a safe and delicious fruit. Good science is good business, and both contribute to a healthy society. And as always, the most direct way to change the world to suit your point of view is to vote with your dollar. Is organic farming important to you? Then buy organic! Every business pays attention to where you spend. 1. For the Topping: Put the flour, both sugars, cinnamon, nutmeg, and salt in a food processor. Add chilled butter and pulse until mixture is chopped to a coarse texture. Add nuts and pulse until mixture resembles crumbly sand. Don’t overprocess! Refrigerate the topping for at least 15 minutes. 2. For the Fruit: Toss the apples, sugar, lemon juice, and zest together. 3. Assembly: Heat oven to 350 degrees. 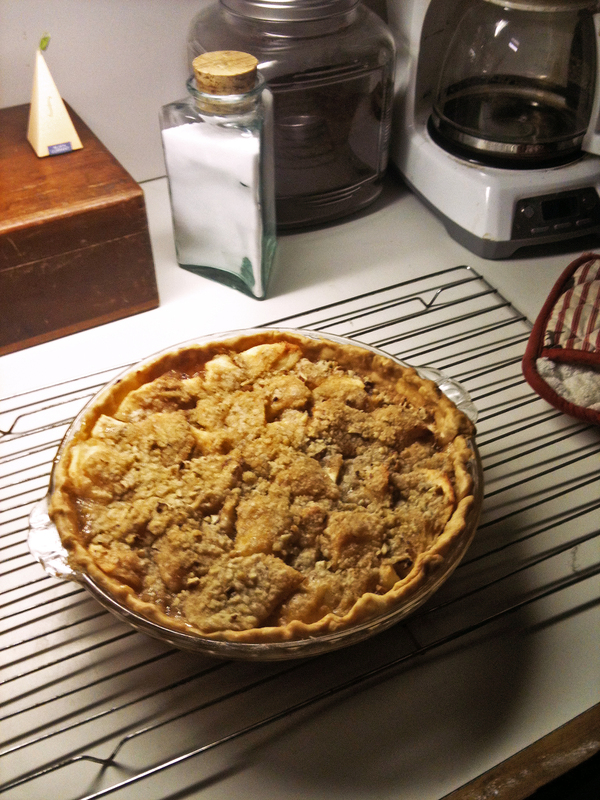 Place a pie crust in a pie pan, and pour the fruit in. Sprinkle the topping over the fruit, and bake for 60 minutes, until the fruit bubbling and the crust is browned. Serve warm or at room temperature. Tip: Serve this with a scoop of the very best vanilla ice cream you can find. In our case, it is from the Round Top Ice Cream Stand in Damariscotta. Open from May 15-October 15, their ice cream is worth organizing your entire year around a visit to them! I can vouch for the fact that this is a great recipe!